We’ve been here a while and our Spanish has only improved slightly. It’s been a bit like hanging around a restaurant’s kitchen for ages and learning only how to peel potatoes. It’s surely now time to make a tortilla. We do our best watching the breakfast news about floods, drug seizures off the coast and city strikes, none of which is too useful for everyday life. We have our grammar and verb books which we test each other on regularly (‘where did you leave it?’ ‘what picture is one cover?’ ‘when was it published?’ that kind of thing). Nothing, of course, beats speaking the language regularly – so an Intercambio de idiomas (language exchange) in Granada is also on the cards – as long as we don’t sit there stuffing our faces with churros at the same time. We have heard very good things about a local Spanish teacher, Eduardo (who’s actually Argentinian). His lessons range from one-to-one, couples to groups (up to around six people). He also does intensive courses too if you’ve just arrived in the area and want to know how to buy a hammock or order a cerveza. We’ve met people who have been here years and who, to us, seem fluent in the language but who still have regular lessons to keep improving. Eduardo works in an office off Órgiva’s main square, Plaza de la Alpujarra. 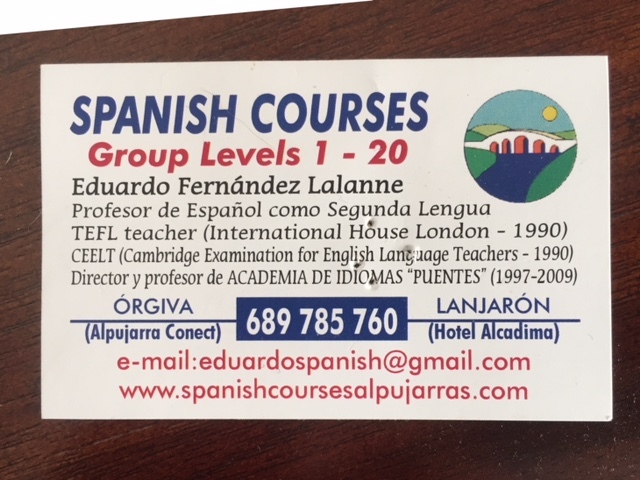 Here’s his business card should you be looking to improve your Spanish. ¡Buena Suerte! [Text of card: Spanish courses, group levels 1 to 20. email eduardospanish@gmail.com, telephone 689 785 760].